i’ve never seen pumpkin prepared like this but it sure does look delicious! Özlem, Once again, your recipe comes just in time. My husband and I just had pumpkin soup for dinner and he happened to mention to me that he wanted me to learn how to make “that sweet pumpkin dessert.” Thanks to you, I can get right on it, especially since I know now that it’s so easy. This sounds a much better recipe than the local one here where the pumpkin is boiled in syrup. This is definitely unlike any way that I’ve used pumpkin in the past. It sounds lovely, especially if I can find some really good walnuts. There’s certainly no shortage of pumpkin at the moment. 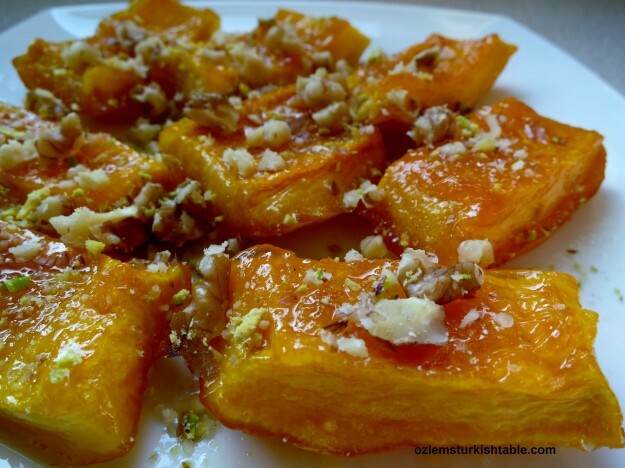 Walnuts and pumpkin go well here Phil; an easy but delicious dessert, thought it would be good to share how we enjoy pumpkin as a dessert in Turkey, especially at the Southern part, glad you enjoyed the post. 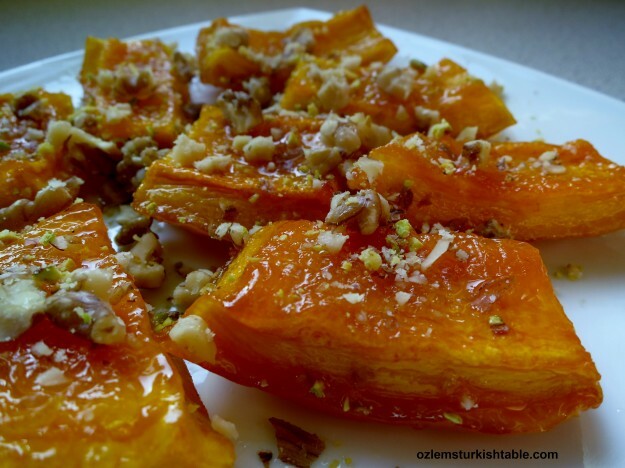 Oooh, this is so yummy and perfectly candied:) Ozlem, love this new use for pumpkin, since it doesn’t work with everything:) and such a unique dessert idea too…keep them coming! XxPeri. This is a marvelous pumpkin recipe, perfect for Gluten Free Tuesday in the face of Halloween and other holidays. I like its simplicity – the pumpkin itself does most of the work. lol Also, the textures are quite nice. I love this ‘pumpkin’ dish. The first time I tried it was about 25 years when I for the first time went to visit my in-laws in Izmir and my MIL made this. I had never had anything like this before, it was so yummy. I’m going to see if I can find any ‘sugar’ pumpkins here and make your recipe…thanks for sharing this Blast from the Past for me. This does sound yummy and looks easy to do! I love the taste of pumpkin! Next autumn I will be trying this for sure and thinking of you! Thanks!! 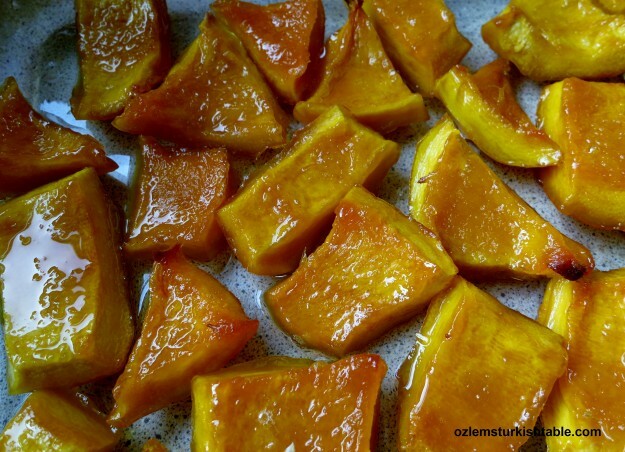 I am a Belizean American, and love pumpkin, it is a dessert from my country of Belize. We do it differently, but will try your method ,which looks very good! 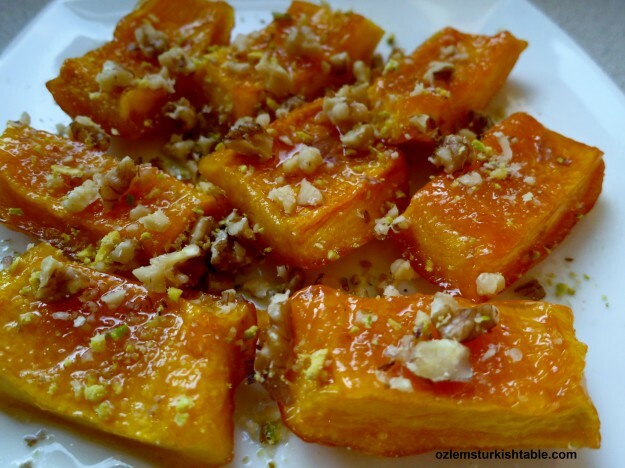 Merhaba Yvonne, many thanks for your kind note – hope you enjoy our way of making pumpkin dessert, afiyet olsun! Many thanks for your note and featuring my recipe, hope you enjoy it! Hello, I see some tiny green pieces on your candied pumpkin. What are they? Hello Joanna, they must be my walnuts and perhaps the left over bits of pistachio nuts : ) Hope you enjoy it! If you can’t get pumpkin, I wonder if this would work with squash? Hello Sharon, butternut squash would work – it would be good to adjust the sugar level to your taste, hope you enjoy it. 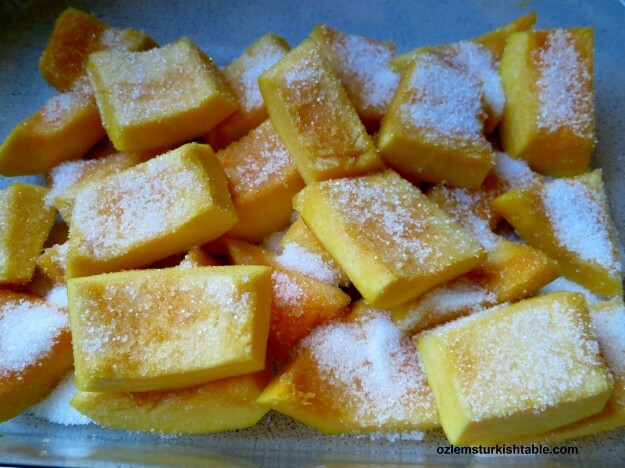 Kabak Tatlisi is one of my favorite desserts. My mom used to make it ( stove top version) all the time. I never tried to make it when I was in Turkey. Now I’m trying with Canadian pumpkin or butternut squash but I keep failing to make it taste the same as Turkish ones. The problem is pumpkin pieces don’t absorb the sweet juice and it takes many hours to soften. The result is less sweet pumpkins with less pumpkin flavor. It just doesn’t taste the same as the ones I have in Turkey. What could be the reason? I do everything as told in the recipe. So far I used different recipes and different types of pumpkins ( basically they are the same) the result is the same flavourless, less sweet pumpkin dessert. I would like to hear your thoughts. Thank you. Thanks for your response Ozlem. Next time I will make it with more sugar and make sure that the sugar is sprinkled evenly on the pumpkins. Also will leave it overnight before start cooking. Thanks again for your time. 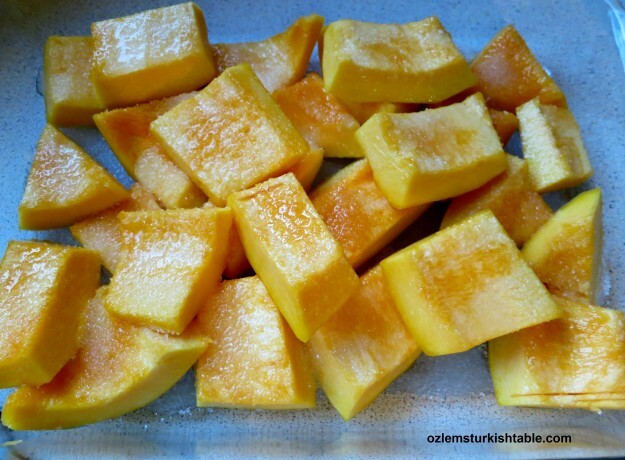 Özlem, I tried this pumpkin recipe with pie pumpkins and after leaving the cut up pieces coated in sugar over night while it released some juices it really was not enough I felt. What’s the best type of pumpkin to use for this recipe. My mom keeps telling me to use a white colored pumpkin. Could this be a valenciano pumkin? Did I not use enough sugar? I remember this dessert being delicious when I was younger and I’d love to make it for my family to try. So excited for your book Özlem! I have been waiting for several years . Can I purchase on Amazon?